Perhaps you grew up eating eggplant where your grandmother had you breading it and layering it into Eggplant Parmesan. Or perhaps you were turned off by it because of it’s spungy texture and odd feel. Maybe you never tried it and never care to. 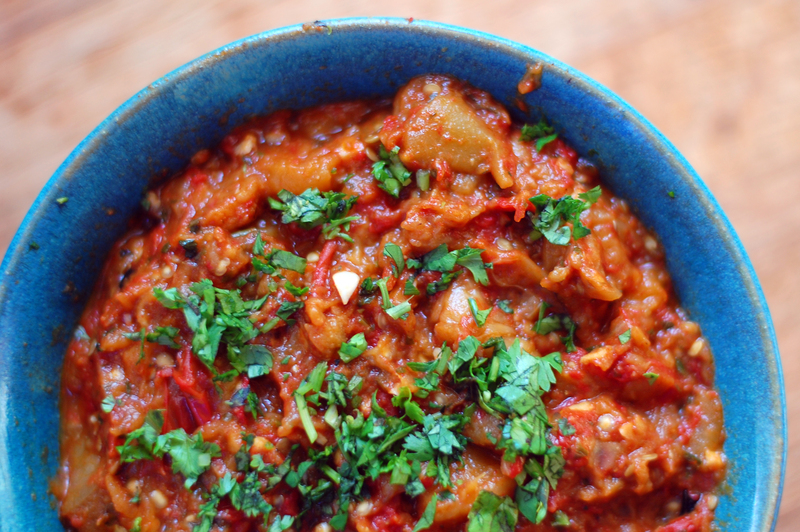 It is also possible you like eggplant and are open to trying new types of cuisines and recipes involving this quite interesting summer vegetable. I can relate to that last one, and for some reason lately I’ve been especially drawn to this night shade. My favorite way to cook eggplant has been on the grill or roasted in the oven with olive oil, salt, and pepper. It is very simple and brings out the flavors quite well. 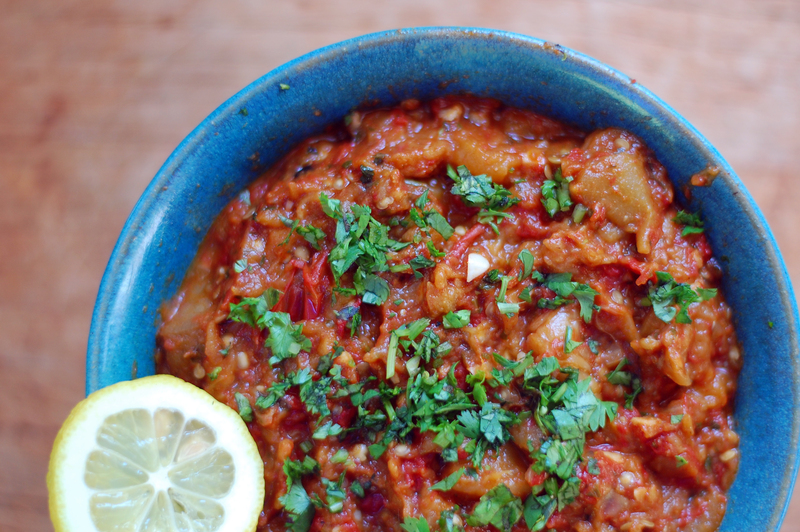 But after making this recipe, I think I can say this may be my new favorite way to eat eggplant. 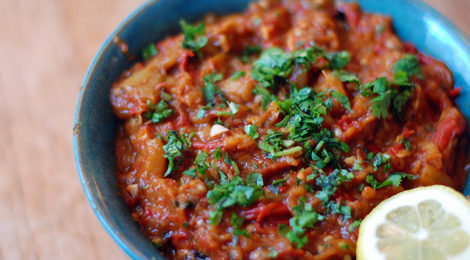 If you have ever been to a Moroccan restaurant, then you have probably tried something similar to this. They generally serve an eggplant dip (they call it a salad) at the start of the meal with some freshly cooked flat bread. 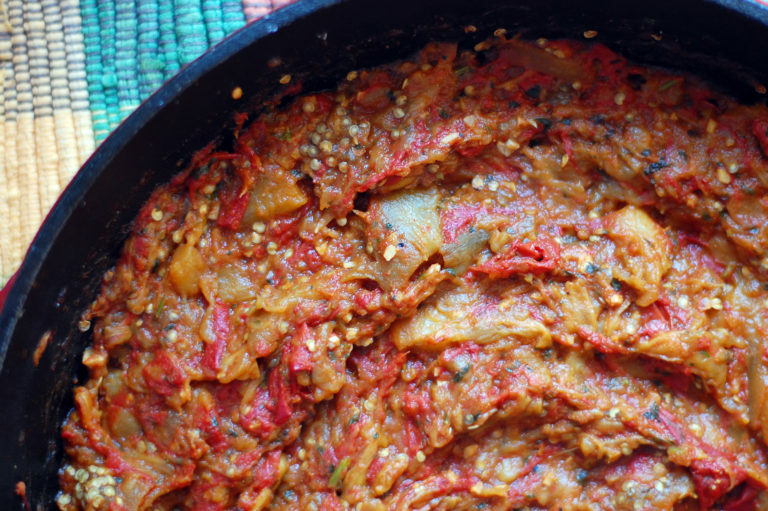 This salad, or dip as I refer to it, is traditionally called Zaalouk. Now I’m no Moraccan cuisine connoisseur, but when I tried this for the first time, I was in love and desperate to make myself. Many months later, I came across a recipe that sounded just about right, so I was all in. With a little tweaks here and there, it turned out to be all that I hoped for. Summer is slowly coming to an end, but not yet are the plentiful amounts of summer vegetables. Our gardens are still proliferating with tomatoes. BLTs, summer sauces, and tomato salads have been on the menu daily. Still I was eager to try something a little different. My love of eggplant combined with the plentiful amount of tomatoes birthed this tasty and authentic dip I’m happy to share with all of you. Roasted, sauteed, and then mixed all together with plenty of spices, there is something that just felt right about making this. If you can make a dish and be temporarily transported to some remote part of the world, then you must be doing something right, don’t you think? 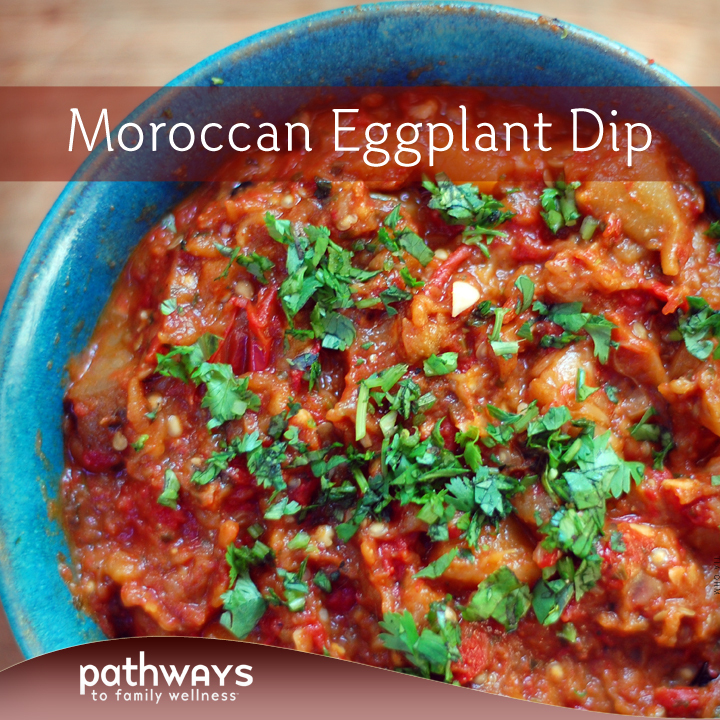 Traditionally served with fresh flat bread, this dip is a wonderful party addition. Serve warm or at room temperature for best results. Add to some fish or meat as a tangy and flavorful accoutrement. Or if you’re like us and tend to avoid bread, simply eat with some organic blue corn chips and you’ll be more than satisfied. Arrange eggplant on a baking sheet and drizzle with olive oil. Arrange tomatoes on a separate baking sheet and drizzle with olive oil. Roast the eggplant in preheated oven for about 20-30 minutes or until golden and soft. Roast the tomatoes in preheated oven for about 10-20 minutes. You can bake both at the same time, it won’t disrupt the cooking process. Remove eggplant and tomato from oven. You can decide at this point if you want to remove the skins of the eggplant since they can be tough. Then roughly chop eggplant and tomato. In a large skillet, heat 2 T olive oil on a medium-high flame. Add chopped tomato, eggplant, minced garlic, cilantro, paprika, cumin, cayenne, salt, and black pepper. Mix well. Allow mixture to cook on medium-high heat, stirring occasionally, for about 10-15 minutes or until the paste has thickened and is no longer watery. Taste and add more salt if needed. Serve warm or at room temperature garnished with a slice of lemon and some fresh cilantro.